Get Voters to the Polls in the California Primaries! California has a grand total of nine competitive Swing Districts—more than any other state. It could make or break our chances of flipping the House in November. But, its top-two primary system also poses a unique challenge. The bottom line: if we don’t get a ton of Democratic voters to the polls on primary Election Day in California (June 5th), we could end up seeing two Republicans, and no Democrats, on the ticket in some Swing Districts in November. 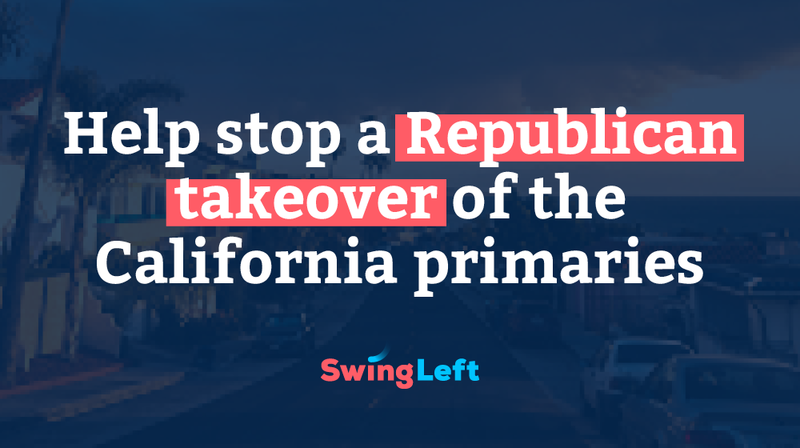 Join Swing Left and other local groups that are canvassing in the California Swing Districts. We know that having conversations with voters is the most effective way to increase turnout on Election Day. Let’s do this! Enter your zip code to find an event happening near you and RSVP!